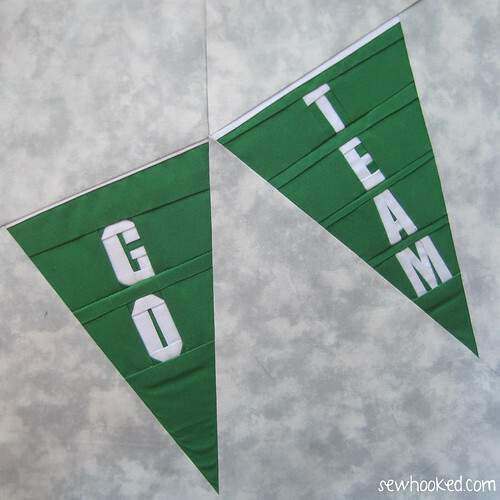 College Days Blog Hop – GO TEAM! Welcome, College Days blog hoppers! Enjoy the free pattern shared here today and make sure to read through to the end to find out how to win a free pattern set from my Craftsy shop! The College Days blog hop comes at a time when we’re just a few weeks away from my own daughter returning to her university for her second full year of college studies. We live in Texas, and the fall in Texas means football. I’m a high school marching band mom and I won’t lie, I’m not much of a sports fan…I attend games for the music! 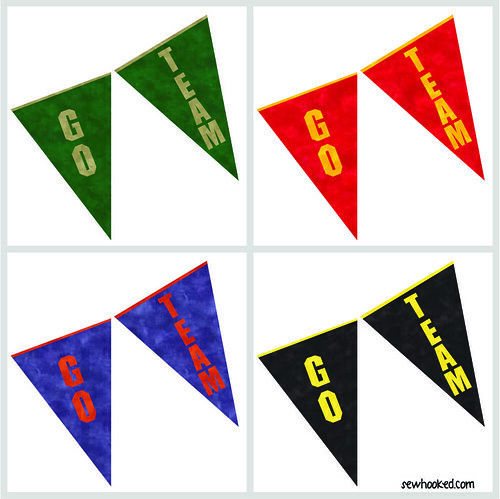 Anyway, while thinking about how to tackle this pattern, one thing kept coming back to me: the university bunting I myself hung on my wall while in college. 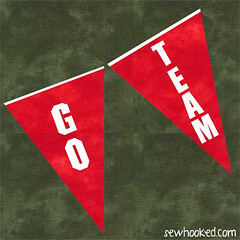 All universities have a team of some variety, whether it be football, baseball, rugby or quidditch! Need some help with paper piecing? Check out my FREE full-length paper piecing workshop! Go Team in UNT Mean Green colors. Caw! The are the colors of my alma mater, Sul Ross State University! This is for The University of Texas, my hubby’s favorite. My brilliant friend and faithful pattern tester, Amber, suggested that this design would be perfect in Hogwarts House colors. She is, of course, absolutely right! As a special bonus, leave a comment letting me know your favorite university team or alma mater for a chance to win a free copy of my Holly Jolly pattern set! Already own Holly Jolly or would prefer something else? The winner can choose any other pattern or patterns of equivalent value from my Craftsy shop! While you’re here, I’d like to invite you to a couple of events going on right now! Join me and lots of other quilters for Paper Piecing Vintage! Registration for the entire year is just $12. That’s 12 patterns in two sizes (plus the occasional bonus! ), entirely paper pieced for one awesome price! All patterns for the year to date are included when you download. Upcoming patterns will be added for you to download the first of each month in 2014. On my fandom website, Fandom In Stitches, every Wednesday into September, we invite designers of all experience levels to join us to design patterns for a new theme and help bring fun, free, fandom-themed patterns to our quilting community! 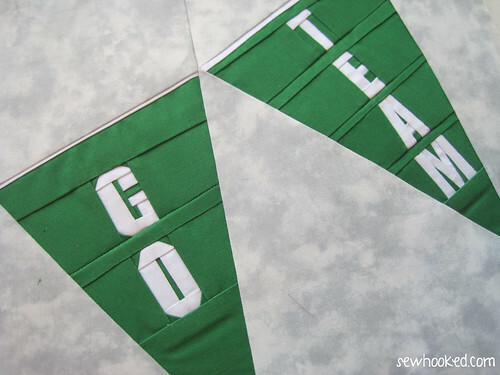 This entry was posted in Blog Hop, designing, Events, Free Patterns, paper piecing and tagged bunting, college, college days blog hop, free pattern, go team, paper pieced, paper pieced bunting, paper piecing, university on July 29, 2014 by Jennifer Ofenstein. Yay, your post is up…I’ve been waiting with baited breath. Loving your block. Sorry, don’t have any favourite team or alma mater. For this block I will likely use our high school colours…blue and gold. Still hemming and hawing over your vintage paper pieced quilt pattern, only because I don’t want it to just languish on my shelf waiting for its turn to be done LOL…Thanks again…love the addition of lettering in this block! A really fun pattern!! 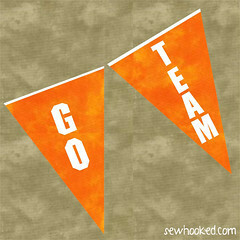 Thanks so much for making it for the blog hop, Jennifer!! Thanks for the awesome pattern!!! The team I cheer for….Vanderbilt!!! Your pendants are wonderful. I did a happy birthday one a while back and did appliqué. I love your work. Another wonderful pattern, this will be great in gold and black!! My favorite University team is Michigan State–Green & White. Thanks for the new block. Love this pattern and how easily it can be customized. Beyond colleges it could also easily be used for your favorite football, soccer, or whatever team sport.